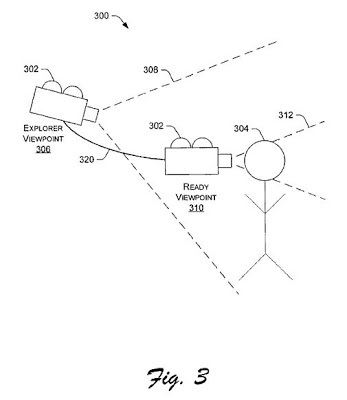 The ‘195 patent provides for a change in camera viewpoint during a third-person shooter. This invention calls for two camera views: explorer and ready. In explorer mode the camera is farther back from the character providing a wider angle of view of the battle terrain. In the ready viewpoint, the camera moves to just behind the character to facilitate better aiming when the character is engaged in combat. The ready view should give the player a better view of the action and help him in battle while the explorer mode allows the player to see all of the action going on. The change in camera aims to make the game more fun for the player by giving different views which help the player. In a third-person shooter video game, the viewing perspective is smoothly transitioned between an “explorer” viewpoint and a “ready” viewpoint as game conditions change. In the “explore” viewpoint, scenes are depicted from a camera positioned behind and removed from a character. The explorer viewpoint offers a wide angle of view of the surrounding combat area, enabling the game player to scout the terrain. In the “ready” viewpoint, scenes are depicted from the camera as it is repositioned close to the character. The ready viewpoint provides a narrower angle of view to facilitate better aiming when the character is engaged in armed combat. The transition between the explorerr and ready viewpoints tracks a non-linear path. 1. In a third-person shooter video game, a method comprising: presenting a scene from a first camera viewpoint remote from a character being controlled, wherein the character being controlled is one of a squad of characters participating in the game and individually selectable for control, and wherein at least one of the squad of characters not being directly controlled by a player performs one or more player-issued commands by way of an artificial intelligence of the video game, wherein the one or more player-issued commands are determined from a range of possible player-issued commands, and wherein one or more player-issued commands are depicted on a squad status display; in response to occurrence of a predefined event, smoothly transitioning to present the scene from a second camera viewpoint closer to the character being controlled; and smoothly transitioning back to the first camera viewpoint after i) the predefined event ceases to exist and ii) a predefined time delay lapses, wherein the predefined event comprises: (i) player-actuation of a controller that directs the character to fire a weapon; (ii) placement of an aiming reticle over a target; or (iii) movement of the character into a specified combat region.